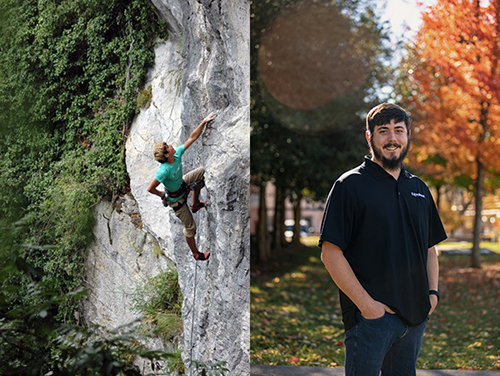 From rock climber to Hilltopper, the journey to the top has been worth the climb for WKU graduate student Mike Arthur. Arthur is wrapping up a college career that began in 2009 with several zigzags along the way. He received his bachelor’s degree in Montana and has earned his master’s degree in geoscience at WKU. In early 2019 he will begin work as an exploration geologist for Exxon Mobil in Houston, Texas. “I took my unique path but I finally got to where I want to be,” he said. That change meant moving from San Francisco, where he had been living with his father, to Missoula, Montana, where he received his bachelor of science degree in geosciences at the University of Montana. He began applying for graduate school again and connected with Dr. Royhan Gani. WKU’s first Imperial Barrel Award team won the Eastern Section and was one of 12 teams that advanced to the world competition in Houston. “We didn’t win but that got our name out there,” Arthur said. Through the IBA team, Arthur made connections with Exxon Mobil that led to an internship and then a full-time position. This month, Arthur and his wife, Shelby, are moving to Texas. She’s been part of his journey for the past several years. Dr. Gani said Arthur’s success is an example of the high-quality teaching and research that are hallmarks of the WKU student-centered experience. “At WKU, we challenge students like Mike to achieve their full potential and transform their lives. Mike’s hobby is rock climbing, and as a Hilltopper, he indeed learned well how to climb to success. For many geology students, starting a career in a top oil and gas company with a world-class research lab and lucrative six-figure salary is a dream job. It is deeply satisfying to see that our students like Mike can land in these dream jobs, jobs that are commonly grabbed by students only at the top-notch programs in the nation. Arthur credits Dr. Gani and the WKU geosciences program with making the difference in his career path. Arthur has a message for students who might be struggling like he did when he began his college career in 2009.